The accordion is an instrument that has been on our ‘to do’ list for quite some time. The instrument can provide you with a very nice ‘couleur locale’ whenever you need to give a song that French twist. The accordion brings a breath of fresh air and evokes feelings of romance, passion and nostalgia. As with other Sonokinetic instruments, we focused on getting a ‘real’ sound instead of a ‘perfect’ sound, as you can hear from the demo tracks skilfully created by our demo composers. We are very proud of the finished product and believe that it will empower lots of people to make MIDI recorded accordion tracks that sound like they were played under a bridge along the river Seine. We started by recording all tones the instrument made, in all registers. For the basses side we captured samples with and without the extra low octave. We also recorded short attack notes for all the basses, at different velocities. Then of course came the challenge of making all of this accessible from a master keyboard, and that’s when we realised how ergonomically ingenious a real accordion actually is. The way the instrument is laid out allows for a great deal of flexibility, allowing you to play all kinds of chords with just one button in the left-hand section, and switching between bass notes along the cycle of fifths really easily. This method of playing explains the often quite complex and challenging patterns played with apparent ease by even mediocre accordion players. Making these patterns accessible to keyboard players would demand more than just mapping the recorded sounds to the keys, so we’ve integrated a sequencer into the Sonokinetic Accordion. 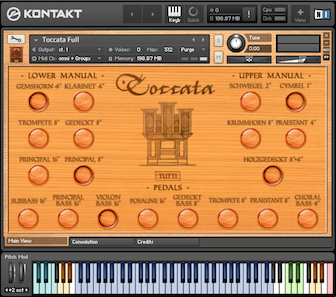 The sequencer allows you to make full use of all the playing styles of a real accordion and do so very intuitively. 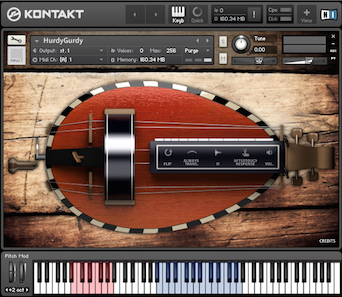 The Kontakt script has a built in chord analyser, so it will automatically choose the right button sample for the chord you play. If you have the sequencer active, it will play one of the preset patterns, or you can program your own, using the interface. The main user interface for Accordion is designed to closely mimic the functions and key layout of a real-life piano accordion. The upper half of the interface contains all of the controls for tempo-synced sequencer programming, volume and reverb. The lower half has controls for choosing different registers, key and button noises. There are several keyswitches that control the sequencer and registers. Before we look at the functions of Sonokinetic Accordion it’s useful to know a little about how a real-life accordion is played. 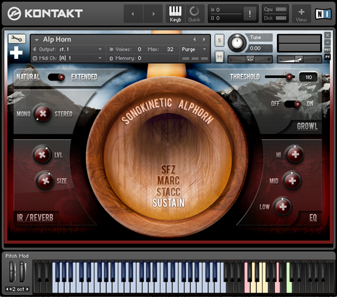 This will allow you get the most out of the instrument and help to make your ‘accordion’ performance more realistic. An accordion of this type is usually worn around the player’s neck, positioned in front of his chest. His two arms will grip either side of the accordion and squeeze and release to push air through the bellows and reeds. This creates the accordion’s characteristic pumping sound. The player’s right and left hands have very different functions: The right hand will normally play a melody on a piano style keyboard. Above this keyboard there are ‘register’ buttons, which create a particular tone by utilising different sets of reeds. The left hand will perform bass notes and chords on a rank of buttons. Traditionally these are used to underpin the right hand’s melody. Sonokinetic Accordion is controlled in a very similar way. 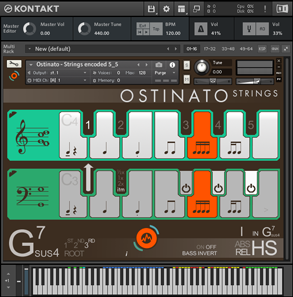 The Kontakt keyboard is split into right and left hand playable ranges indicated by the blue keys. 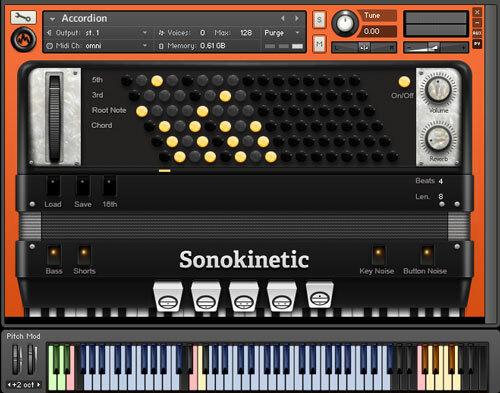 A real accordion has a very distinctive style of playing which you can easily emulate by using the on-board chord sequencer within Sonokinetic Accordion. This feature makes it incredibly easy to lay down live accordion performances using both hands to play.